Saturday, March 25, the Charismatic Renewal of Raleigh participated in a half day of Renewal titled: “Mission Possible! 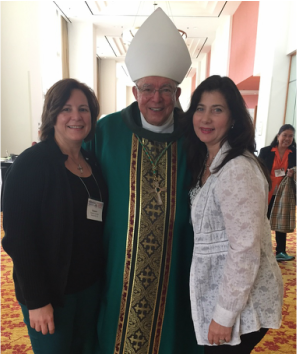 The Mission of the Church – How I Participate”. It was held at St. Joseph Catholic Church and sponsored by “One in The Spirit” Prayer Group. A ten-member team from New Creation Community facilitated the day. New Creation Community is a Catholic, Charismatic, Covenant Community, recognized as a Lay Association of the Faithful by the Diocese of Richmond, and with Communities from around the world, is a member of the Catholic Fraternity, a Lay Association of the Faithful of Pontifical Right. The Day of Renewal was conceived almost a year ago over a cup of coffee and a sisterly conversation with Wendy Edwards, whom I initially met in 2014 when I was visiting my Raleigh children. As we shared, the conversation drifted to: “Was there a way that New Creation could serve the Raleigh Diocese?” As we spoke and prayed during the following months, we began to hone what would best serve the Raleigh Renewal. Our conversations went to a core of why the Charismatic Renewal exists – for people within the Church to be empowered by the Holy Spirit to evangelize to the person of Jesus Christ. The first talk centered on what God asks us to do, “The Lay Vocation to Evangelize: To Be Salt and Light to the World.” The second talk, “Listening to The Holy Spirit and Sharing What He Says.” helped us learn to be equipped to do the work of evangelization. Following the talks, we watched a demonstration of listening and sharing what the Holy Spirit shares with one individual for another. Then the participants split the large group into pairs. We prayed, listened, and shared with our partners what we received from the Holy Spirit for them. This time encouraged both partners through the words and pictures that were given and received. It also gave each person an opportunity to take a risk; we were praying with people we did not know or know well. The field is white with the harvest. The wheat is coming. It will follow you as you walk through the fields. Be prepared! We ARE the harvesters! God has not given us a spirit of fear but of power and might! My word and breath flow through you, just as through my Handmaiden. Will you say YES? The Lord truly DOES GREAT things for us! Thank you, Wendy and One in The Spirit Prayer Group for inviting us, New Creation Community, to meet, encourage so many of you in the Renewal. Of course, we were encouraged by meeting and serving you. God is in the relationship business. I have been blessed to have prayed with One in The Spirit Prayer Group during my family visits to Raleigh. We, New Creation, are happy to be forging a relationship with the Charismatic Renewal in Raleigh. We will continue to pray for you and all that the Holy Spirit is about in Raleigh; please pray for us as well. Thank you to all who provided such a healthy lunch. What a variety of choices! Thank you to the families who provided housing Friday night. Thank you, participants, for your active involvement. Thank you, New Creation Team. How good and pleasant it is when we serve together! This word is for NCC, Richmond, and Raleigh. The Lord is speaking directly to us in Ex. 19:4-6a and Is. 65:17-21.‎ The Holy Spirit is preparing to come forth like a Spring bud that appears to be dormant but then comes forth in full bloom. He is saying to us it is time to stop pussyfooting around and begin to boldly proclaim the Lordship of Jesus, the Baptism in the Holy Spirit, and Community (Covenant Community). The fields are ripe for the harvest and the wheat will be coming to us as we walk through the field. ‎The Holy Spirit has been restrained, but now He is breaking through! Be prepared! Be prepared! The Unbound Conference in Charlotte, NC was a wonderful opportunity to learn about healing and deliverance ministry as well as receiving personal ministry using the Unbound Model of Prayer. Several of us received training on how to use this particular model of prayer by observing Neal and Janet Lozano firsthand in a prayer session with a volunteer. The conference itself was powerful and people had a chance to be ministered to in the afternoon as prayer teams assembled around the church sanctuary; the Five Keys, aligned with prayer through the power of the Holy Spirit, was used to bring healing and freedom in Christ to many! Unbound teaches how to listen and respond in Five Key areas as you seek greater freedom and help others to do the same. Each key incorporates practical direction on how to respond to the grace that unlocks the door and set us free. Key 1. Repentance and Faith- There is no greater deliverance than embracing the grace of baptism, by turning from sin and turning to the Lord. Jesus is our deliverer and He is our deliverance. The first key also involves on going repentance and conversion as the hidden sins of our heart are revealed. Key 2. Forgiveness If we want to be like Jesus we need to forgive from the heart. Many believers who know they need to forgive have failed to understand how to access the power of forgiveness that Jesus has given them. As forgiveness is pronounced by faith and the power behind forgiveness is renounced, it is defeated. Key 5. The Father’s Blessing. The Hebrew sense of blessing means to speak words that empower someone to prosper and thrive. They are words that give life and peace. Words carry spiritual power. Every blessing that the Father spoke to Jesus is ours. As we learn to receive His blessing, so we are healed. To be “unbound” means that the obstacles to the gift that has been waiting for us have been removed and the Father’s love and affirmation is made real to us in Christ. On December 10th, the Raleigh Catholic Church Diocese had their first Diocesan Christmas Party at St. Michael Archangel in Cary, NC. We had many people and families at the party from many of the churches in the area including, St. Joseph, St. Bernadette, St. Andrew, and St. Michael. We also had people from Durham, New Bern, and Wake Forest. It was so wonderful to see families coming together with their spouses and children to the party. The Christmas party was a potluck party. The people truly outdid themselves with bringing food and desserts. We had various dishes from salad to ham, and side dishes that included macaroni salad, broccoli salad, and potatoes salad and much more. The dessert was plentiful and delicious. We were able to sit down in round table and enjoy the food while having great conversation and laughter. After dinner, we continued to mingle and meet new faces. The children and teens enjoyed themselves dancing and playing games. The Christmas Spirit was indeed alive and moving among each one of us. We will like to thank everyone that took the time to help us put the event together, decorate the room, and to all the chefs’ that cooked and all that purchased food and drinks. This party couldn’t have been a success without all of you. ​Among the many speakers, priests, nuns, deacons and lay people at the National Leaders and Ministries Conference, Bishop Sam Jacobs shone like a beacon and stood out as a guiding paternal shepherd. He was impressive yet surprisingly approachable throughout the weekend. The gifts, such as tongues, prophecy, healing etc., were abundant and flowing this weekend during all parts of Mass, praise, prayer, teachings and fellowship. We were all floating on clouds of joy and peace as the Spirit descended upon us. You can't get better than that! Bishop Sam gave testimony during his homily to all of us urging us "not to give in to despair or weariness but to trust God and be available when the Holy Spirit calls". He not only speaks his testimony but lives it as an amazing Charismatic leader. You may visit his website at www.spiritaflame.org. Bishop Sam Jacobs was ordained to the priesthood for the Diocese of Lafayette in 1964 where he served as pastor, chaplain, and associate pastor of several parishes there and also in the Diocese of Lake Charles. He has served as chairman of the National Service Committee for the Charismatic Renewal and diocesan director of Vocations and Seminarians for the Diocese of Lake Charles. Bishop Jacobs was appointed the tenth bishop of Alexandria in 1989 and was installed as the third bishop of Houma-Thibodaux in 2003. He retired in October of 2013 and is now the bishop emeritus of Houma-Thibodaux. He celebrated 50 years of priesthood on June 6, 2014, and marked 25 years of episcopacy on August 24, 2014. ​​Adoration of the Blessed Sacrament is a beautiful way for the faithful to pray, meditate, and praise the Lord for all that He has done for us in our lives and for the world. Fr. Ian Van Heusen, Parochial Vicar at St. Bernadette’s Church in Fuquay-Varina, has a passion for what he calls “the art of worship”. For the second time this year he organized an evening of praise and worship Holy Hour on Saturday, November 5th, 2017. Dana Catherine, a Christian recording artist and friend of Fr. Ian, provided the live music as Fr. Ian led the people in reflection and spontaneous prayer. Many people commented on the reverence and peacefulness of the evening and that the contemporary Christian song choices were inspiring and they were able to sing along. Hearts were moved and filled with the love, joy, and peace that accompanies being in the presence of the Lord. I sat down with Fr. Ian to discuss his future plans for this type of Adoration and what inspired him to bring it to our Diocese. He said that he participated in praise and worship Holy Hour in Philadelphia and a few other areas and wanted to introduce it to our smaller communities in order to raise awareness of Catholic art and how it can be incorporated into liturgical celebrations. Praise and worship is also a celebration that we, as Catholic Charismatics, believe in strongly. One of Fr. Ian’s goals is to bridge the charismatic and orthodox sides of the Catholic Church; combining praise and worship with Adoration is a great way to do that! He anticipates having additional Holy Hour Adoration a few times a year in different areas and parishes including St. Joseph’s in Raleigh and also parishes in Fayetteville and Wilmington. He adds that he “realizes that some people have more of a leaning towards contemporary Christian music while others enjoy the more traditional music” and he plans on offering both styles to accommodate different musical tastes. He has also worked in youth ministry and recently held a retreat in which he incorporated praise and worship music as part of the retreat and he hopes to inspire other priests and young seminarians to do the same. In addition to his love of praise and worship, he also embraces other types of art like videography. His website has his own videos and commentaries with catholic teaching, inspirational messages, and articles covering a wide range of topics regarding spirituality and faith. He keeps up with national trends in the Catholic Church and he wants to use all forms of Catholic art to inform, inspire, and illuminate us. His website entitled “The Art of Living Well” is a great forum for doing this so be sure to check it out at www.ianvanheusen.com. The next Adoration Hour he has planned with Dana Catherine right now is tentatively scheduled at St. Bernadette’s in May 2017. Then there may be two more at other locations in June 2017 and July 2017. It should also be noted that Dana Catherine is scheduled to appear at the Ignited by Truth Conference in March 2017. Her first album, “Glorious Horizons”, was released in September 2015 and is working on a new album. Her single, “My Savior in Me”, can be found on Amazon, iTunes, and Spotify. If you are interested in contracting Dana for an event please visit her website at www.danacatherinemusic.com. 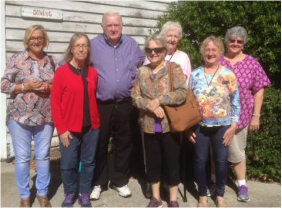 I had the pleasure of meeting a wonderful Spirit-filled group of nuns at the National Leaders and Ministries Conference in Atlanta, Georgia this weekend. 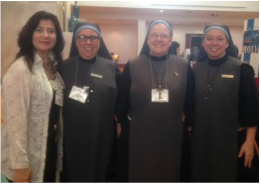 They are the Disciples of the Lord Jesus Christ, a Franciscan Charismatic Religious Institute of Sisters. Sr. Damiana has agreed to keep the entire Charismatic community of the Diocese of Raleigh in prayer and intercession. That includes our prayer groups, leaders, ministry teams as well as present, past and future members. Please contact them if you have a private prayer request or would like more information about their community. Sr. Lucy Lukasiewicz, DLJC was a speaker on fire and gave an awesome testimony. What a beautiful sight to see these joyful nuns singing and dancing in the Spirit. In Isaiah 55:8, God says that His ways are not our ways. God has shown Himself to each of us in a whole new way. He has asked us to use his gifts, in His AUTHORITY, for His glory. We can’t let the routines of life sidetrack us from what has been given to us. After this retreat, I feel as though I were brought to heaven and now must return to earth. Going through the motions of normal life after time with the lord seems mundane and boring. The Lord doesn’t want us to be bored but, rather has more in mind for those of us who thought we were past usefulness. He has cleansed us from deep within and revealed things we didn’t know were there. We have been healed. We need to remember that, and not go back to the way things were. We were brought here to be blessed and trained for His service to be witnesses. We’re called to share His love with family, friends, and neighbors. We have learned that FORGIVENESS is a requirement, not an option. I don’t think that any of us have any unforgiveness in our hearts as we leave here today. Instead, Love and joy are in abundance. Let’s pass on this forgiveness revelation to others as we enter everyday life. We learned that it’s necessary to SPEAK the word of healing, the word of wisdom, the word of knowledge without fear of looking foolish. His sheep have heard his voice and we will follow Him. We will follow with actions that confirm the word given to us, especially in prophecy, or when he leads us to intercession. Praise God in song and in tongues and Satan can’t get to you. Our spirit knows what the Lord wants of us. Praying in the Spirit is the form of perfect praise. Paul say’s, ‘pray constantly and rejoice, again I say rejoice’. Let’s keep our eyes on Jesus and never evil more credit than is due. One of the blessings of being in a community of believers is that they can help us discern if we are NOT in the Lord or if we’re hearing from OTHER spirits. Sharing this time has brought us closer to each other, as well as, the Lord. I now understand the benefit of early Christians living together in community. We’ve become part of each other’s lives, sharing both joy and sadness. We are one in the Spirit! The Spirit will lead us every step of the way if we let him. He loves a willing and humble heart, like Mother Mary Read the Acts of the Apostles and the letters of Paul to see what the Lord can do when we’re open to the Holy Spirit. We can’t help but be joyful, even in the midst of pain, with the knowledge that He will not take where he will not keep you. Last, but not least, pray for REVIVAL. Pray for Revival to come to our parishes, our towns, our state, our nation and to the whole world. I for one want to part of the action. I say YES- how about you? ​The Jeremy Camp I Will Follow Tour with Citizen Way and Royce Lovett came to the Catch The Fire Worship Center in Durham. 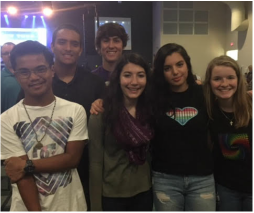 Our St. Michael’s youth group gathered together with Damaris Acevedo and Tommy Kowas. Also joining us were members of St. Bernadette’s, St. Andrew’s, St, Michael’s and St. Joseph’s prayer groups. This was not only a concert but an amazing witness from the artists. Throughout the evening we heard testimonials and Biblical references. We were praising God and having a great time doing it. We were singing and dancing in our seats. Jeremy Camp has 12 years of accomplishments as a songwriter and recording artist, including four million albums sold, and a GRAMMY nomination. Jeremy describes himself as “a minister who happens to play music as a way to minister.” Over the last year and a half, this ordained minister has experienced a season of artistic growth and musical creativity, evident with his new album, I Will Follow. Jeremy often finds God teaches him through song. The first single off the new record, “He Knows,” is one in which God spoke comfort over Jeremy’s past. As he shares in his book, I Still Believe, Jeremy lost his first wife to cancer at age 21 and in recent years, lost a baby to miscarriage with his wife. There are a lot of people hurting, and they often turn to Jeremy and his music. Jeremy’s songs reflect years of studying God’s word, in which he gained a foundation from growing up in a pastor’s home and attending Bible college. Ministry for him is a lifestyle, one in which the whole family participates. Jeremy and his wife Adrienne, have two daughters and a son. Just looking at the pictures, you can see how this singer appeals to all ages! ​Girls Chat with Christ is a ministry for young girls to come together to share their everyday life experience with each other and to learn who they are in God, how God sees them, and teach them how to build a long lasting relationship with the Him. These chats will offer them a place where they can open up and be themselves without being judged, ‘laugh out loud’ until their bellies hurt and cry when they feel blue. God so wants them to learn to be free in Him and not rely on the earthly world view. Through this ministry, we will read God’s word together, pray, and have various discussions. We will go on a one-day or weekend retreats to spend time with the Lord. We will be mixing up the activities to bring some excitement in our lives but always keep it in safe and with God blessings. 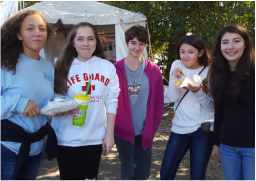 The Girls Chat with Christ ministry met for the first time at the NC Fair on Sunday, October 23rd. This was a great way to meet each of the girls and allow the girls to meet each other and have fun. We went on several rides and shared some food with each other especially the huge turkey legs. Overall we all really enjoyed each other accompany and had tons of laughter and conversations. As of today, we have 7 girls and 1 girl pending. God has truly handpicked these wonderful and beautiful girls. As I was starting the ministry, God was sending me these girls. He didn’t wait until I had a plan or until I had prepared myself. One girl at Charismatic Prayer Conference met another girl and told her about the ministry. By the end of that day, I had two girls and an outing to the NC Fair. By the end of the week I had three girls and by the end of the month, I had six girls. When God asks you to do something and you say yes, all things will fall into place even when you are not ready. I feel so happy and honor that God has chosen me for this ministry. I thank you God for the blessings and trusting me with this ministry and with the girls you are sending me.